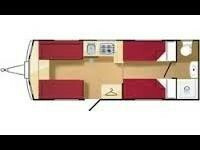 Elddis Xplore 574 is a single axle caravan with 4 berths. It has a rear washroom, twin beds, central kitchen and forward lounge. It has a BPW chassis, Winterhoff hitch stabilier, Dometic fridge, Thetford oven/grill, TV aerial, carpet, cd/radio, Whale heating system, cassette toilet, window blinds & fly screens, door fly screen, 1 x tv point, 4 x 240v & 1 x 12v sockets, solar panel. Supplied with a full service, valet, 6 months warranty and a fully working handover on collection. Please ask your sales person for further details.